The goal of the future is full unemployment. -Arthur c. Clarke. Patna: PhD scholars applying for fourth-grade peon jobs is not a new sight in India as unemployment continues to be one of the biggest challenge being faced by the country of 1.3 billion people. But there are others who are taking alternate routes and carving their own niche. Zafar Eqbal, a small town guy from Sheohar near Muzzafarpur in Bihar is one among those. After completing his schooling from Bihar and BA and MA in Hindi literature from Delhi University, he chooses to do MPhil from Delhi University and later PhD from Jamia Millia Islamia in Hindi literature. Like any other student he also wanted to work in his own academic field but seeing the uncertainty and chaos in the job market he chose a different path. While pursuing his PhD he decided to go back to his village and started working at the grassroots level. He believes in action rather than words. After finishing his PhD he permanently shifted to his village to bring change in his village. Mr Eqbal had a long list of aspiration for his land. He wanted to do something for his land; this is how he always concludes himself. During his stay in Delhi, when he talked of his future, he was not sure what exactly he was going to do. But he always said that he wanted to go back to his village and work for his community. He ended up starting cloth weaving company in Bhagalpur with two other local people. In December 2017 he officially registered his company in the name of Kolika, but in March 2018 Kolika started manufacturing its cloths items especially Saree, Kurta, Duppata, Bags, Nehru Jacket etc. Now Kolika has taken the shape of a brand in the garments industry. It is becoming famous and creating its own space among people and Eqbal is planning to launch its website as well. Now, Kolika is a firm running on the idea of Eqbal and many others. One of his dreams has come true in the form of Kolika but there are many more to achieve. But the idea is not just to start a firm and do business but also to run in a different way, which helps the marginalized people of society to get employment as well. While researching in Bhagalpur, he found a woman who was working in a handloom factory for 50 rupees per day. 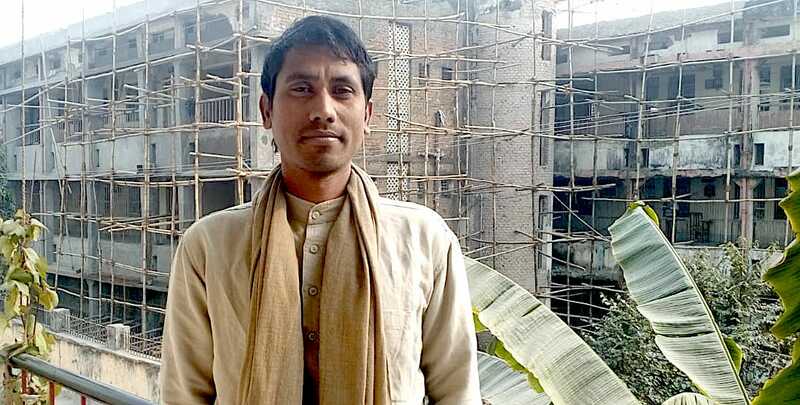 He met the woman and got to know about her ordeal and decided to run his firm, not as a business but a movement in the handloom industry of Bhagalpur. All the fancy stores in Delhi brought their silk thread from Bhagalpur and sold them at triple cost. So his idea is to make a cooperative of handloom factories, which will help the workers to get better wages rather than profiting the big firms which are just using their names. Along with Eqbal, the firm is owned by two local weavers of Bhagalpur. All these directors are working as employees. They all are working there on salary and their plan is to use rest of the money to create the cooperative and help those people who are in need. Kolika weavers are progressing day by day because if its noble idea. Beyond Headlines salutes Mr Eqbal for this great initiative and also his determination of leaving all the comfort of the city and going back to the village in Bihar. Anyone who is interested in getting in touch with Eqbal can reach him at 8826621950.